Reviews: "Vanessa's Pain" and "Vanessa Runs"
“Vanessa’s Pain” continues the story of the spin-off series main character as she tries to figure out what to do now that she has left home. 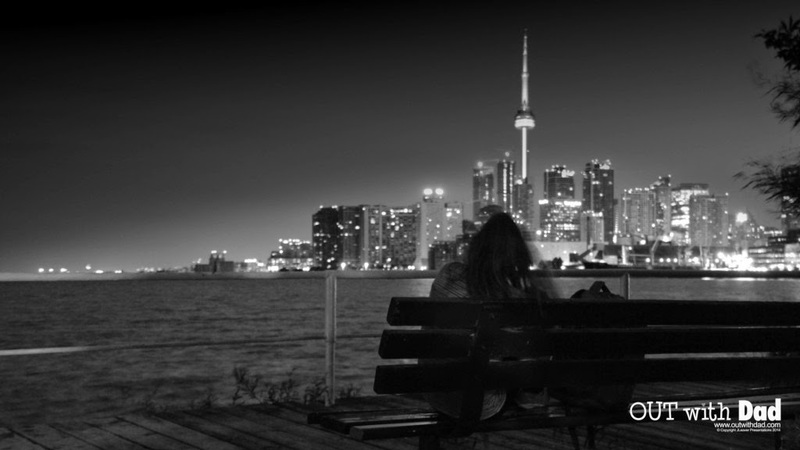 It seems obvious that she neither wants to go home nor go back to Kyle’s house, but she wanders about Toronto trying to find something else. Like “Vanessa Alone” this episode begins with a dialogue-free segment highlighting Vanessa’s wanderings. The creepiest event in this beginning is when Vanessa eyes some discarded food on top of a trash can, and she looks at it longingly. This scene is excellently acted and filmed, as it told the story perfectly without the use of dialogue. Vanessa is seriously considering taking the food, when a passerby throws a broken umbrella on top of it, and the temptation is gone. We know now that Vanessa does not have any food, and apparently brought no money, so is hungry, alone, and desperate. Then she happens to spy Rose on her double-date with Claire, Nathan, and Angela. “Vanessa Runs”, the next episode in which a distraught Vanessa runs away from Kyle’s house and spends the night on a park bench. She is then bothered by a really creepy looking older guy. Boy is he creepy! Anyway, this results in her deciding she needs to find someone she can trust to help her out. She then ends up in the place I, and probably many others, was hoping she would go after leaving home: her brother’s place. If you remember, back in season 2, it was mentioned that Vanessa’s older brother married a Muslim woman and was excommunicated from the family for doing so. It’s one of the reasons Vanessa has had such a problem accepting her sexual orientation. She had predicted how her parents would react to news that she wasn’t straight (way back in episode 2) and she was absolutely correct. It’s a sad reality that many parents can’t accept their own children as they really are, but have a specific idea of what their children should be and that idea cannot be violated. Which is why it is so important that the first thing Vanessa says to her brother is “I’m bisexual”. (Well, after “Big Ginge”.) She has come to her brother to get some kind of family support that she is okay despite not being what her parents want her to be. She fears that he’ll report her whereabouts to their parents, which is probably why she didn’t come here first. However, I think he’ll keep quiet as long as Vanessa says to, for support and fear that she’ll take off again. The family dynamic also plays out in the news that Vanessa is going to be an aunt, but her parents haven’t been told yet. We leave Vanessa in some comfort, though the future is still very unsure. Vanessa’s story will continue on the 3rd section of season 3, and it is bound to be less dark than it has been so far. It has been a sad tale, full of darkness and fear, but a story that I think needed to be told. As I said before, I never really thought about the demographics of runaways, and I’m very glad Jason chose to tell this story. It reminds me, and hopefully other viewers, of hoe bad things can really get and why it’s so important for us to be supportive in our lives and active in promoting supportive behaviors from others. Reviews" Vanessa Alone" and "Vanessa Lost"
I am going to start discussing Vanessa’s Story, the web-series spin-off of Out With Dad. First, I’d like to make some general comments about the series. 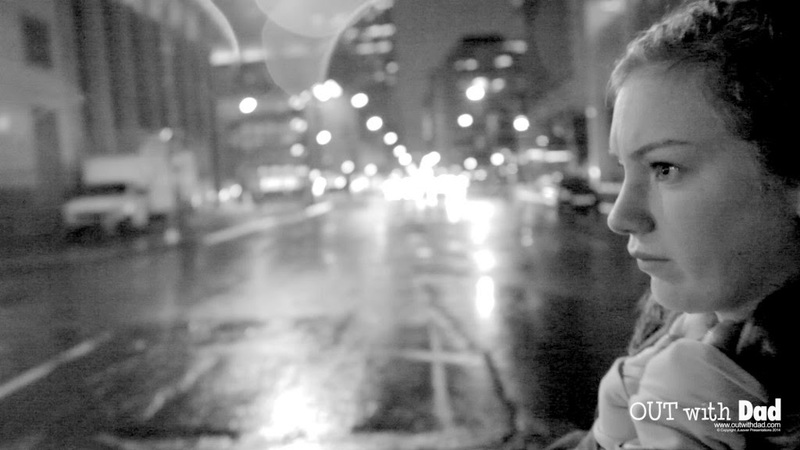 First, I think it was a great idea to shoot the series in black-and-white. It isn’t something I was expecting, and it really sets the tone for the series. The anguish is evident in Vanessa as her world is empty and cold, and our perception of that world matches her feelings. Also, the entire idea of doing Vanessa’s story-line as a spin-off series took me by surprise. Like the musical episode, this shows that Jason is being bold and taking chances with his creation. I really like the willingness he has to mess with things. It keeps the series from becoming formulaic in any sense, and these chances have been very successful in my view. Finally, I must note how much this series shows the ability of Lindsey Middleton to bring the role of Vanessa to life. This series is a testament to her acting abilities. And her producing as well. Though I don’t really know what a producer does. I’ll have to research that someday. The first episode of Vanesa’s Story is called “Vanessa Alone” and tells the tale of her first day as a runaway. The episode begins with an extended montage of Vanessa wandering around Toronto and her parents at home trying to contact her and arguing. During this the only sound is some creepy music. It is over 3 minutes into the episode before we have dialogue. Together, these elements really set the tone for the series. The dialogue begins with the introduction of a new character, Kayla, another runaway that apparently attempts to help and befriend Vanessa. Vanessa gives Kayla half a sandwich, and Kayla gives Vanessa some information about places to stay the night. Kayla also picks up on Vanessa’s sexuality quickly. Jason noted in the written introduction to the series that a disproportionate amount of runaways are LGBT youth, something I’ve never thought about. Vanessa soon finds herself at Kyle’s place, and has an interesting conversation about sexual identity, that includes some common views about bi-sexuality. Specifically, that bi-sexual people are gay people that are afraid to commit, but will get there eventually. The episode ends with Vanessa’s parents trying to decide if they should call the police or go visit Rose and Nathan to see if they know where Vanessa could be. “Vanessa Lost” begins with Vanessa at Kyle’s house trying to sleep but scared out of her wits by some heated argument that Kayla tells us is between Kyle and Erica. Kayla comforts Vanessa and the two kiss. I’d say this is an important moment for Vanessa, as she is accepting her attraction towards other girls. However, Kayla proves to be less of a friend than she seems as she disappears the next morning with Vanessa’s phone. However, Vanessa does have a nice conversation with Tracy about being Bi, and how it is a real thing. I’d think the common misconceptions are covered in their conversation: the idea from last episode that bi is just a transition stage to being gay, and the idea that Bi is just a straight person experimenting. Tracy (and Jason and company by extension) shatter these misconceptions but if this would make Vanessa feel better she is then torn apart as Tracy describes a story that sounds very much like what Rose has been experiencing due to Vanessa’s reactions to Rose’s feelings for her. This is my favorite part in Vanessa’s story so far. It really makes Vanessa see things from a different perspective, which is something we should all do now and then. This episode also ends with a scene involving Vanessa’s parents, this time as they are talking to the police. The conversation makes them understand a bit about how they pushed Vanessa away instead of helping her. I noticed upon re-viewing this episode that the police officer’s face is never shown during this scene, which is a very effective decision as it keeps the camera on Vanessa’s parents and their reactions. Robert Nolan and Wendy Glazier, who play the parents, do a great job in this series, and deserve mentioning. I've heard that it’s fun to play the villain, but in this case they are now villains that the viewer starts to feel sorry for. Great job! Okay, I've gone on long enough for now. I’ll write more at a later time. Another program I recently decided to revisit is the classic TV series “Lois and Clark: the New Adventures of Superman” which ran on ABC for four seasons from 1993-1997. I watched most of the episodes when they first aired and must say I also have enjoyed them the second time around! For those of you who do not know, Lois and Clark told the story of Superman in a weekly format that concentrated on the characters and their interactions while they stopped some nefarious plot by some villain. The special effects are rather primitive by today’s standards, which is one of the reason the plots are more character rather than action-driven. 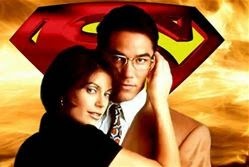 However, this is done to a great success which I mostly contribute to the chemistry of the main characters, especially Teri Hatcher and Dean Cain as the title characters. So let me discuss the characters first. Lois is a strong and independent minded reporter, who tends to get in a lot of trouble. A bit too much often, which gives Superman a chance to save her. However, she does save herself from time to time, and never seems like Superman’s sidekick. Teri Hatcher must be the best looking Lois ever, and I think she really nailed the part. Truth is, I have a character in my Mutant Elf comic named after her! 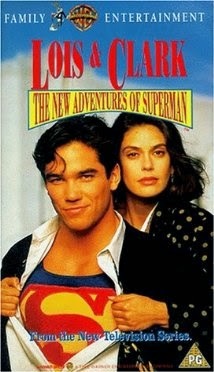 Dean Cain does a good job as Clark and Superman. He’s goofy when he’s trying to protect his secret identity, and strong and serious as Superman. It can’t be easy to act in those tights, and to not make fun of the character, but Dean plays his dual roles very well. My wife seems to especially like scenes when he’s shirtless. I don’t understand that, since he’s out of costume, but whatever… The show took carries on the idea John Byrne started with his 1980’s Superman revamp in the comics and kept Clark’s parents alive, which works great as they give Clark people to talk to about his secret. At the Daily Planet, Perry White and Jimmy Olsen are the mainstays, and make some nice, though limited contributions. Now, about the stories: The show used Lex Luthor as the steady bad guy in the first season, then started a villain-of-the-week format from season 2 on, though Lex does come back for a few episodes. According to the DVD commentary, the show was revamped to be more kid-friendly after season 1, and I do think some aspects got more campy as time went on, though nowhere close to the 60’s Batman series. The main story arc is the will-they-or-won’t-they relationship between Lois and Clark, which is handled very well. There are a lot of big name guest stars, which also reminds me of the old Batman series, and I think some of the actors ham it up a bit much. Also, I think you can get distracted if you think too much about the special effects. As I noted above, they are not super-cgi effects, and sometimes you can tell that Dean is being lifted on a platform or the green-screen is goofy, but I think you have to suspend your disbelief and go with it. Nothing in the show is as ridiculous as the glasses disguise for Clark. If you can accept the dual identity, you should be able to accept the rest. In conclusion, I’d encourage anyone who has never seen this series to check it out, and those of us who watched it long ago to revisit it. It’s good, clean fun!